Spent a short time in Venezuela in Caracas and around Angel Falls. Angel Falls were fairly quiet, with not a lot of water flowing, but the 2 flights we did around the gorge were stunning. 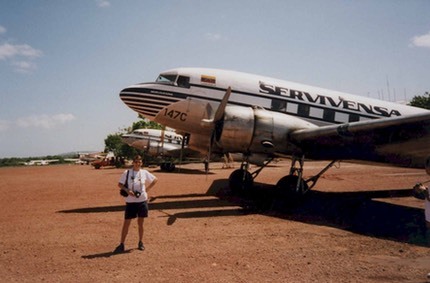 Most tours use one of the many DC3s still flying, although if you can do it in one of the small taxi-type Cessna aircraft, do! Being smaller and slower its down to the pilot's skill how close you go. You can also see wreckage of planes that didn't make it! A wrecked DC3 was pointed out by the captain with a tap my shoulder and a finger across the throat gesture. My first attempt at Spanish resulted in a table being delivered to our room, rather than a table for 2 being reserved at a nearby restaurant. Oh Well - next time. Don't try the metal detector at Caracas Airport, with a Swiss army knife in your pocket! Cessna, flown by 'El Capitano' We went canyoning after a trip on this plane and saw snakes and poisonous frogs. I got bitten by a giant red ant which I hadn't noticed. A huge line of these giants were using the rope hand rail of an Indiana Jones type bridge for a river crossing. We saw El Capitano at the airport when we left. he wandered over with a loud Hola Amigos and a handshake, earning us massive respect amongst the sprawling crusties. DC3 - There are several of these with enlarged windows for tourist trips, but on the day we went there was a lot of low cloud which obscured good views . You need to do this trip soon as approximately one a year crashes reducing the fleet !. Our second trip to Venezuela came on our round the world extravaganza. 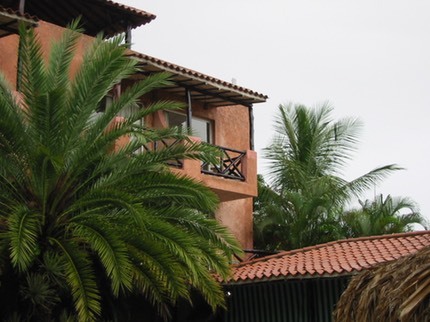 We wanted to do two things here, relax on Margarita and visit the Llanos wetlands. Caracas is no less scary than before and has probably deteriorated with the people seeming even more morose. After reaching Margarita we were knackered and decided to stay somewhere for at least a week and do not a lot. We found the hotel Coral Caribe which had $20 rooms with aircon and fridges. Breakfast was also included and it turned out to be fantastic. Limitless food and juice so you could load up with enough to get through to dinner. To be honest we really did do nothing for 8 nights and spent each day by the pool. The room in the picture was ours which had sea views and also overlooked some wasteland so there was good bird watching too. It was tough when the time came to leave but we had to be in Merida for our Llanos tour. There are not many tourists in Venezuela at the moment so we were quite pleased to find a group of people on a llanos tour. The Danes had been robbed on arrival at Caracas airport by a taxi gang. We had a 3 night tour that included some white water rafting, plenty of river trips with wildlife and a stay deep in the wetlands at a local bloke's house. 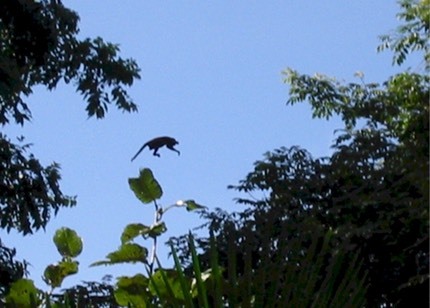 The bird watching and wildlife was superb and I was really pleased to catch this photo of a jumping howler monkey. 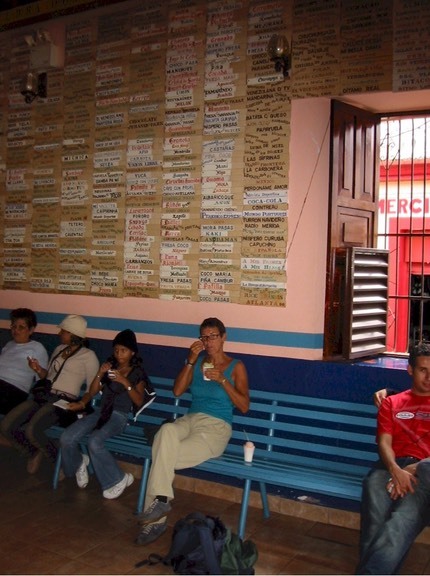 Back in Merida with some time to kill we visited the Guinness Book of Records ice cream shop with the most flavours. I had a triple combo with chilli, plantain and caiparinho which blew my head off. The guy who took us on the Llanos trip was an avid butterfly man and had identified a new species that he was trying to collect and categorise. We had arranged to go out with him again on our last day to see if we could catch some on Lake Maracaibo. The end result was that we got one and this was it. 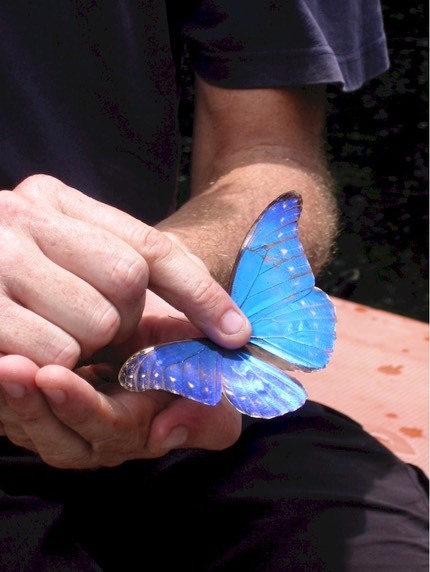 A blue Morpho, hopefully of a new sub-species.